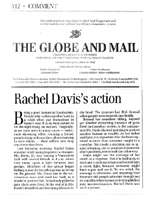 On January 4, 2004, Rachel Davis died protecting a stranger from being beaten outside a Vancouver nightclub. She was 23. The circumstances of her death have inspired many people across Canada, just as her life inspired her family and many friends. She died the way she lived: helping others. To remember Rachel and honour the spirit of youth, her family has created the Rachel Davis Award. Each year, the award will go to a young person who through an outstanding act of integrity, kindness or compassion, has affected the lives of others in a meaningful way. 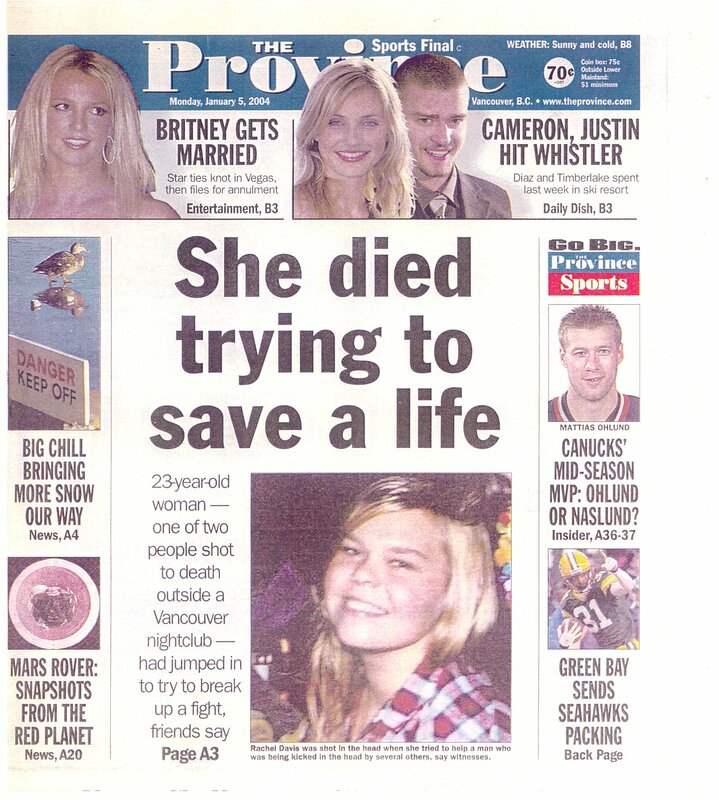 In the early hours of January 4, Rachel and some friends were leaving a Vancouver nightclub when a fight broke out. A young man was thrown to the ground as several others attacked him; Rachel intervened - and put herself between the combatants, appealing for calm. In the ensuing moments shots were fired, leaving Rachel and another young man dead, and four others wounded. Within days, Rachel's action became a national news story, inspiring many people across the country. Her memorial a week later filled the Arts Club Theatre to overflowing, even including journalists who knew her only from the story of her death. The City of Vancouver has been inspired to create a Hall of Heroes as part of a major redevelopment of the city-owned Mountain View cemetery, naming Rachel as its first honouree. In May 2004, the City of North Vancouver created a special Random Acts of Kindness Pathway memorial at the new Lonsdale Skate Park. 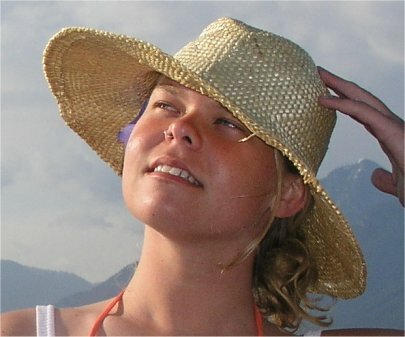 Each year the City will recognize special acts of compassion by North Van youth in Rachel's memory. On July 1, 2004, her friends persuaded North Vancouver District to allow a memorial tree in Sealynn Skate Park - the site of an annual Canada Day event in the Vancouver skateboard community. Actress Diane Ladd has planted a memorial tree in the JFK Memorial Forest in Israel for Rachel and her own daughter who also died tragically early in life. Rachel received the Vancouver Police Certificate of Merit in April 2005, and was awarded the Governor General's Metal of Bravery in June 2007. The first Rachel Davis Award was presented to Erin Fogarty of Regina, Saskatchewan in September, 2007. The Foundation is presently looking for a sponsoring organization to participate in future awards.